In this story, Batman and Robin, the Elongated Man, and Slam Bradley travel to England to prevent the assassination of Queen Elizabeth by Edgar Moriarty, who is replicating a plot hatched by his great-granduncle against Queen Victoria that was thwarted by Sherlock Holmes. The elderly but still spry Sherlock Holmes appears at the end of the story to lend a hand. Edgar's cousin Thomas Moriarty and his fiance, Mary Watson (great-granddaughter of the good Doctor) also play a prominent role. Per this story's listing in Vol. 2, this Batman is Bruce Wayne Jr., the son of the original Caped Crusader and the third to hold the mantle. Win doesn't specify who the Robin in this story is, but since Jason Todd was the Robin of this era in the comics and for most of the '80s, perhaps that's true in the CU as well. Win theorized that Edgar and Thomas Moriarty were the grandsons of Dominick Medina from John Buchan's The Three Hostages, whom Rick Lai identified as the Professor's nephew in his essay "The Secret History of Captain Nemo." Win further speculated that Mary Watson is the granddaughter of Dr. Watson and Nylepthah's unnamed son who appears as an infant in Farmer's The Adventure of the Peerless Peer. Also included in this entertaining story is an account of how Holmes thwarted the Professor's scheme a century before, illustrated by E.R. Cruz, who also drew a one-issue Sherlock Holmes comic for DC in 1975. I love the hell out of this comic. It was so much fun. 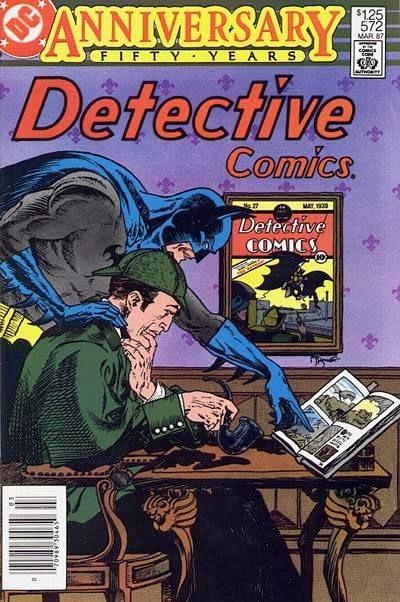 DC had a great array of wonderful Detective characters, and this was a great tribute to detective fiction as a whole.